– NBE-Therapeutics develops next-generation iADC products with the aim to improve the outcome for cancer patients, as it continues to develop iADCs based on its proprietary technology platforms. With its proprietary SMAC-TechnologyTM to generate site-specifically conjugated ADCs and its proprietary highly-potent anthracycline toxin platform, NBE has the ability to develop highly targeted treatments with long-lasting anti-tumor immunity. 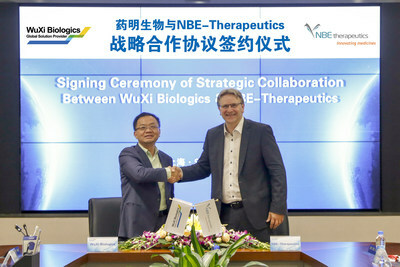 The partnership with WuXi Biologics will enable the supply of NBE’s product for clinical trials under Investigational New Drug (IND) applications worldwide. With the establishment of state-of-the-art integrated biologics solution center, WuXi Biologics provides comprehensive one-stop service to global partners for antibodies, ADC drug substances and drug products.